Hola! I've locked Ian up in the cupboard under the stairs for a few minutes so I can write a few words on this blog. Actually he is out trying to decipher which van is bringing what produce to our village and when (more on that later). You’ll be getting a pretty good idea of how life is panning out here in Spain but I wanted to talk briefly about one of my top objectives this year and that is: GET FIT! In London I found it so damn difficult to get fit. I’m not a huge fan of going to the gym and there was no local gym in Bermondsey anyway. I did cycle to work but that was basically the sum of my weekly work out apart from a few longer cycles at the weekend. The key to getting fit, I believe, is to do something that you enjoy. I enjoy being outside and getting from A to B under my own steam (not motorised vehicle) This is basically running, cycling and swimming. Now that we are in the middle of a vast area of Spanish countryside - I have endless opportunities… and NO excuses! I found out that Spanish don’t really do swimming pools it seems. Outdoor swimming pools close at the end of August even though the temperatures are still mid 30’s and there is not a cloud in the sky till November. Apparently there is an indoor pool in Granada but thats 30 mins drive away. So, two options left. Running and Cycling. Well, that spare tyre is going soon. 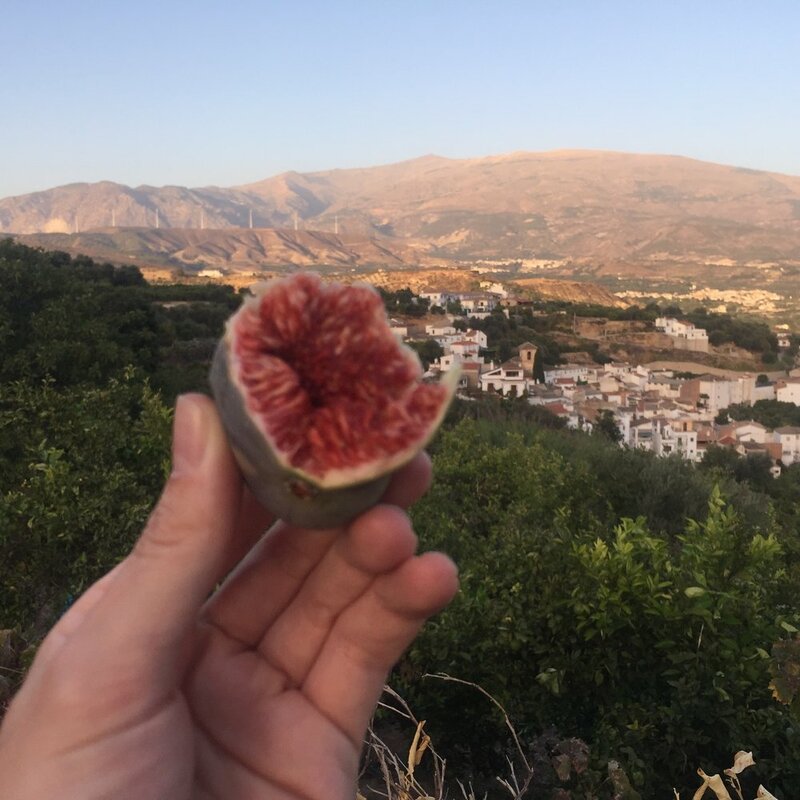 Munching on figs en route. our village and Sierra Nevada in the distance. We have seen plenty of cyclists on these roads around us, of all ages, and I mean ALL ages. Some way beyond their 60s, all clad in lycra. There is no joking about wearing lycra here. Its just practical. I could not wait to put my bike together after it had been dismantled for the journey and get out onto those…undulating roads. Yesterday morning I was up with the lark…no, sorry, I was up with the barking dog and cockerel and horn blowing bread van, slipped on some lycra and skipped outside ready to test the newly put together bike and visit the local village of Albeñuelas (as above) but taking the high road which is how we get there by car…. As I turn round the corner to start the ascent I quickly realise that I haven’t properly taken into account the gravity of the situation. The first 700 meters or so are, I think, about a 12% gradient. I wasn’t in my lowest gear but it was too late. I stood up and peddled like buggery. 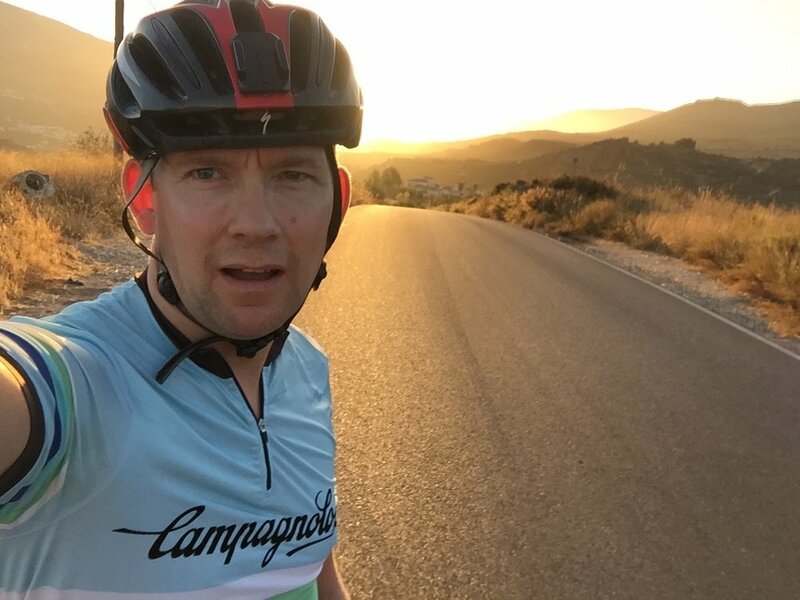 Sadly though, I am not Wiggo or Froomey and something had to give, namely my chest which, after 1 mile of relentless gradient was in such pain i thought i was going to die. I don’t think I have ever quit a cycle. I’ve stopped and carried on many times but this time I simply had to turn round and go home. Below are links to the route mapper I’m testing out - Mapometer.com. It shows gradients and elevation. I’m not convinced its 100% accurate but it certainly gives you some idea of the terrain I’ll be tackling here. We respect your privacy and will not pass your details to a third party. Thanks for subscribing to our post updates! Do feel free to post comments and ask questions.